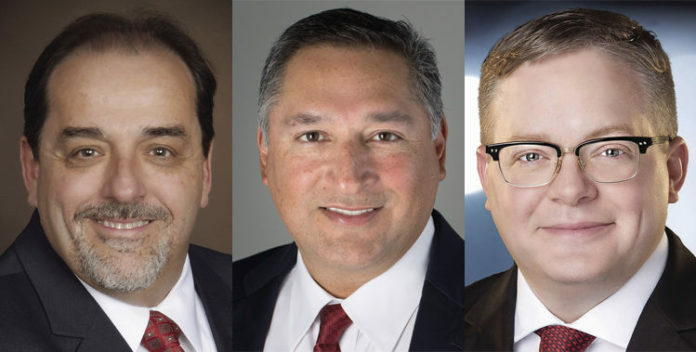 From left, Dr. Joseph Caporusso, Javier Villalobos and Tim Wilkins, candidates for District 1 commissioner in McAllen. McALLEN — Joseph M. Caporusso outspent Javier Villalobos by nearly $3,000 and Timothy Wilkins by slightly more in the past month as the Jan. 20 special election for the District 1 seat on the city commission looms. Caporusso, a physician, spent $7,227 since Dec. 20, which was aided by a $10,000 contribution from the Border Health Political Action Committee, according to campaign finance report filings with the city secretary’s office. Villalobos, an attorney, was not given political contributions, according to filings. Both Caporusso and Villalobos filed their eight-day campaign finance reports Friday. Businessman Timothy Wilkins missed the Friday deadline but submitted his report Monday, which shows $3,685 in expenses between Dec. 20 and Monday. Wilkins previously spent $41,582 thru Dec. 20. The other report Wilkins is referring to is the personal finance statement, which was due Monday. Candidates are required to file the statements, which entail candidates’ financial stakes and interests. All three candidates filed their statements Monday, with Villalobos turning his in after the 5 p.m. deadline. Caporusso’s statement disclosed his involvement with Doctors Hospital at Renaissance, as he’s discussed during his campaign. DHR is tied to the Border Health PAC. Caporusso last made a monetary contribution, which was for $100, to the PAC on Dec. 15, according to Texas Ethics Commission filings. The last day of early voting is Tuesday. Voting on election day, Saturday, will be held from 7 a.m. to 7 p.m. at Gonzalez Elementary. As of Saturday, 602 people had voted, according to the city secretary’s office. The northeast McAllen District 1 seat opened when Commissioner Richard Cortez announced his candidacy for Hidalgo County Judge in September.